Conjunctiva: edema, hemorrhage; Cornea: edema. Conjunctiva: Severe acute diffuse edema and hemorrhage. Cornea: Mild edema. 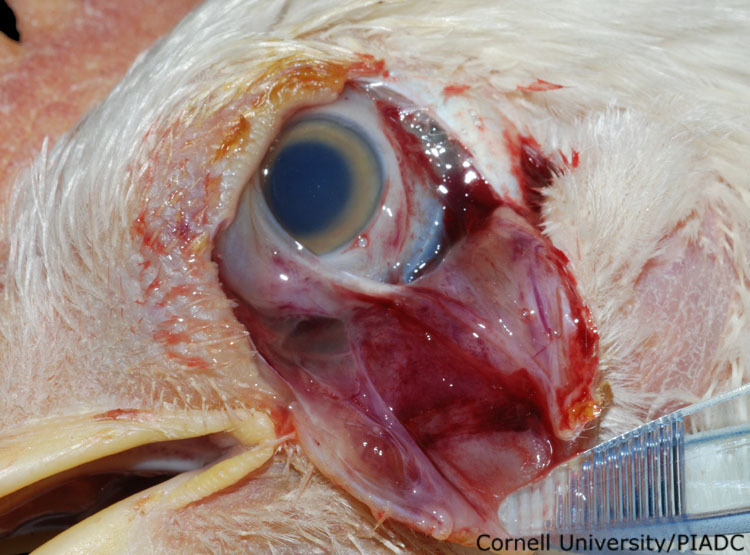 This image was taken 4 days post experimental inoculation with viscerotropic velogenic Newcastle disease. This image shows a variety of ocular and periocular lesions associated with the viscerotropic strain of NCD virus. The conjunctiva has been reflected back to show that the mucosa is swollen, dark red and wet. Small red foci extend onto the nictitating membrane and the cornea is slightly cloudy.